PLANTING: Thyme can be started from seed, cuttings, layers or root divisions. It is easy to start from stem cuttings. Transplants can be set out anytime during the growing season but spring is best. HEIGHT: Creeping thyme grows 3" - 12". Common thyme grows 15" - 18". SPREAD: Creeping thyme 18" - 36". Common thyme 15" - 18". FINAL SPACING: 12" - 24"
BLOOM/FRUIT: Tiny star-like flowers bloom throughout the spring and summer in shades from crimson to pink or white. GROWTH HABITS/CULTURE: Small 1/8" - 1/4" long, slightly pointed highly aromatic leaves ranging from glossy dark green to wooly silver or variegated green and gold. Woody stems. Upright and prostrate varieties are available. Hardy to below zero degrees. Thymes like well-drained soils and full sun. If not kept pruned, thyme branches become very woody and are easily split by wind or animals. Zones 4 - 9. PROBLEMS: Susceptible to root rot, crown rot, and fungal disease when grown in unhealthy soil, especially if it is poorly drained, too heavy or watered too much. HARVEST/STORAGE: Harvest anytime during the growing season just before the plants bloom. Cut entire stems and store dried or frozen. CULINARY USES: Use fresh for the best flavor. Thyme is used to flavor many foods and teas. The flavor is best in teas if thyme is boiled for a few minutes before simmering, but to maintain vitamins and nutrients, steep 5 - 10 minutes in hot water - covered. Thyme infused in oil makes a good salad oil, also good in vinegar. MEDICINAL USES: Thyme has been used to relieve colds, flus, and respiratory symptoms. Use to flavor foods or in teas to help stomach aches and bronchial conjestion. The tea can be gargled for sore throats and used as an antiseptic mouthwash. LANDSCAPE USES: Good border plant and low growing landscaping ground cover. Stepping on the edges of the plant along walks or stepping stones offers a wonderful garden fragrance. Avoid stepping on the crown, which will damage the plant. OTHER USES: Thymes are good for bonsai planting. INSIGHT: Thymes are notorious cross pollinators, like the mints, and new hybrids pop up every year. Thymes fall into three broad groups: upright subshrubs 12" - 18" tall, creeping herbs up to 6" and very flat creepers only 1" - 2" tall. 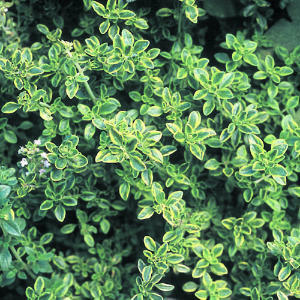 The culinary thymes are primarily in the upright subshrub category, and nearly all are cultivars of common thyme, Thymus vulgaris - creeping mother of thyme. Thymes are among the easiest herbs to propagate. Semiwoody cuttings taken in fall, winter or early spring will root quickly in potting soil. Because of their branching habits, thymes are well adapted to layering. Peg down a branch with soil or a rock and roots will form quickly. The new plant can be cut away and carefully transplanted. 170,000 seed per ounce. Seeds stay viable for 3 - 4 years.